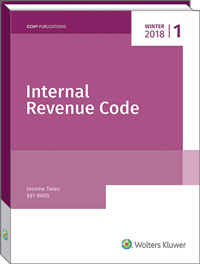 This comprehensive and authoritative resource provides full, unabridged text of the complete Internal Revenue Code in two volumes. CCH offers this tax information in a timely and reliable manner that business and tax professionals have come to expect and appreciate. This Internal Revenue Code: Income, Estate, Gift, Employment and Excise Taxes (Winter 2018) reflects all new statutory tax changes enacted as of December 31, 2017. CCH's Internal Revenue Code is presented in a reader-friendly format, with an expanded 7-1/4" x 10" oversized page and larger type fonts for enhanced readability. And, it features a two-volume format to allow for a more legible single-column presentation of the Code provisions themselves. Reproduced is the complete Internal Revenue Code dealing with income, estate, gift, employment, and excise taxes, along with all the procedural and administrative provisions. Current text of the statutes are presented, and a history of each tax code section, or subsection if appropriate, is provided in the amendment notes. The amendment notes specifically identify the changes made by prior Acts and serve as a means of reconstructing the former text of a Code section or subsection if reference to prior law is required. The detailed Topical Index located at the end of both volumes reflects all matters covered, so researchers can quickly pinpoint any information needed, and rate tables are also helpfully included. CCH's readability, detailed amendment notes and accuracy have proven beneficial year after year--and are now further enhanced by the easy-to-use format featuring 7-1/4" x 10" oversized pages, with larger type fonts for enhanced readability. Serious tax professionals who rely on the Code in the normal course of their work know they can count on CCH's Internal Revenue Code over any other volumes available. The CCH Code is also great tool for students in tax courses who need the latest Code provisions, and it has served for decades as a useful tool for new hires and for firm-wide distribution. This bound set remains very popular as a desktop reference in the new millennium--even for professionals with extensive electronic tax resources. Such tax professionals value it as an easy-to-access and easy-to-read print complement to their electronic libraries. Internal Revenue Code: Income, Estate, Gift, Employment and Excise Taxes (Winter 2018) is now available in an eBook format which you can download to your computer instantly.